Lift the flaps to find the matching pairs in this fun novelty series that's all about habitats! This book has seven die-cut flaps on every spread for little ones to lift to find the matching pairs and spot the odd one out. Lift stones to find turtles, seaweed to find seahorses and shells to find crabs, then answer a simple counting question. The first two books in the series are Underwater and In the Garden. Printed on sturdy card, perfect for little hands, these books provide enjoyment while and about or at home, as well as teaching important recognition and memory skills. ‘Pairs! 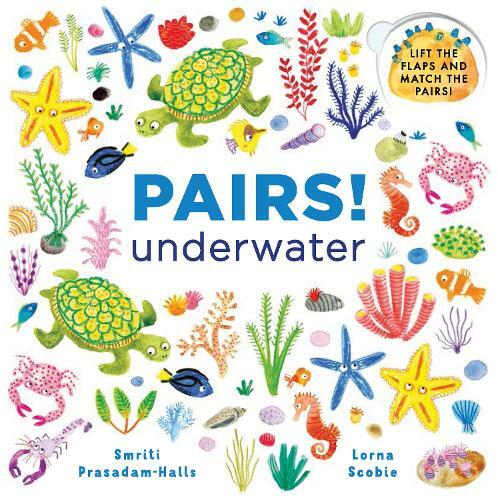 underwater’ is a winner!-a charming lift the flap book for little ones to play peekaboo with whilst discovering more about a watery world.